Brandon Naurato is the director of player development for Total Package Hockey Detroit. For more information on TPH, click the logo above. With Pavel Datsyuk being back in the hockey spotlight, it seemed like the perfect time to assemble a blog post with accompanying video about something incredibly under-appreciated in hockey. The art of the takeaway. Datsyuk always did it best. That’s what made him a 3 time Selke award winner and an iconic two-way forward. He was so good at assuming possession of the puck that his takeaways and the goals that followed would make highlight reels left and right. He’s not the only one, though. Last time I looked at the top 15 players in the NHL that were leading the league in takeaways, I realized that they were all ‘skill’ guys. Five of them were also leading their team in points, while a sixth – Toronto’s Mitch Marner – was two points off of the team lead. You didn’t see fourth-liners and shutdown centers at the top of the takeaways chart. Guys like Connor McDavid, Nikita Kucherov, Taylor Hall, Artemi Panarin – they are points leaders, and they are takeaways leaders. It all shows that a player’s performance and skills without the puck are crucial. Skilled players play without the puck. 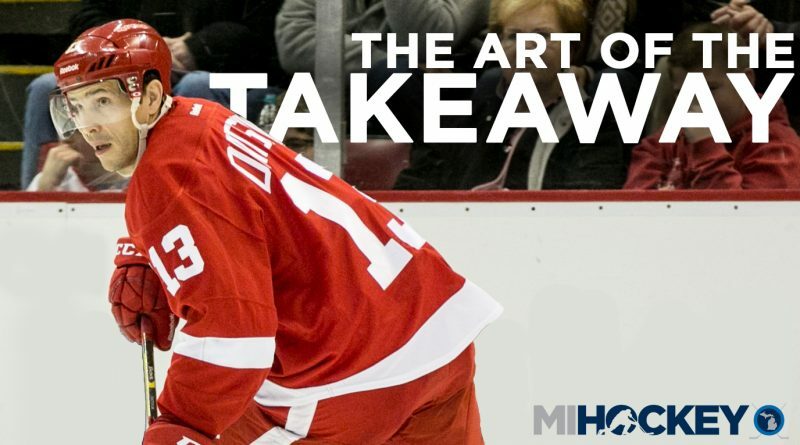 They backcheck hard, know how to angle properly on the forecheck and they know the stick details necessary to strip the puck and force turnovers – all in the mission to regain control and put up points. These are important skills for young hockey players to master. You need to be just as good without the puck as you are with it. Winners get the puck. The video below shows some of the game’s best players stealing and forcing turnovers. In the first few clips, you will see great examples of angling and stick details, then we’ll progress into stick-lifts and hand-eye skills as it relates to causing turnovers. See Mats Zuccarello angling on a forecheck which results in him eventually scoring? Watch as he approaches the defender and the stick details that went into creating the play. These examples show how elite players force guys into bad positions or force them into turnovers. The clips also illustrate the direct correlation between takeaway/turnover and scoring to show young hockey players that the work’s worth the reward. The second video is for coaches – clips that show back pressure and tracking, and then offensive-zone and neutral-zone forecheck clips. Coaches, show these to your kids and implement them into your team. I want these to be good video examples that coaches can use as a resource as we all try to guide better hockey players. Back pressure or tracking, whether it’s coming out of the zone or coming back through the neutral zone, leads to offense and more possession time when it’s done right. These videos show everything in terms of where guys are going, where their stick pressure is, where they are angling and how they are manipulating guys to put them in bad spots. Remember, players – if you play the right way without the puck, then you’re going to be in a better spot offensively. To score goals, you need the puck. Here’s how you get it.